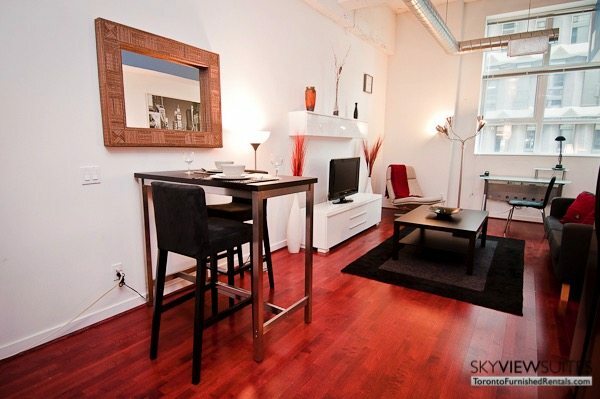 Like the look of lofts but have never lived in one? Are you a stickler for exposed piping, who can still enjoy modern day touches like drywall? 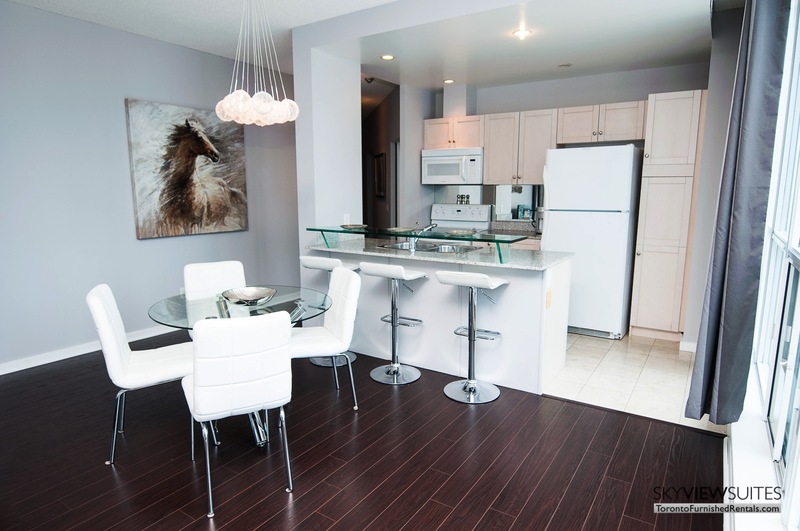 Did you think you were not capable of finding these features in Toronto short term apartments? Guess what? You were wrong! But that’s okay; no need to beat yourself up about it, you can still come here and stay. This landmark historical building possesses an array of changed loft styles, created by 3 teams of world renowned interior designers. The teams have produced a project with enough variety to suit any urban lifestyle. Look up, but don’t snap your neck, that’s 12 foot high ceilings you see. 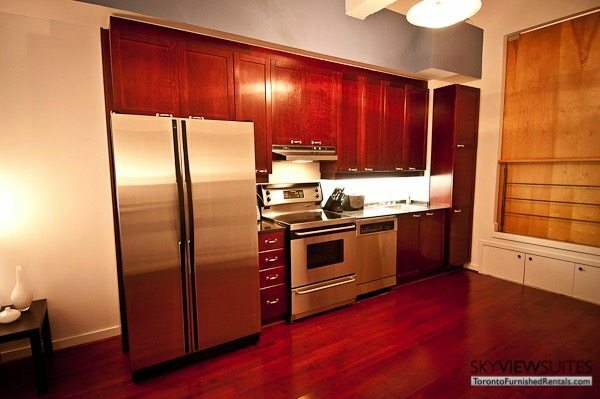 The kitchen has been designed custom and carries top of the line stainless steel appliances, and granite countertops. The whole unit seems to have a very airy and open feel; there is a dining table which can seat two. Behind that is the living room area with a cozy couch, flat screen digital TV, reading chair and a work desk propped up by the window. European beech strip hardwood floors flow throughout the main living area. Up a few steps is the sleeping area, solid maple barn doors enclose the bedroom off, making it private. There is a queen sized bed in there on top of a carpeted floor. The bathroom is classic and has a stand up shower with glass enclosure. Furthermore, the building has an impressive rooftop garden and seating area, a lap pool and barbecue terrace with panoramic views of the lake and downtown Toronto. Numerous recreation facilities available include a huge basketball court and fully functioning fitness facility. As well, there is a games room which houses a pool table, foosball table, air hockey and a ping pong table. The lobby is remarkable, it’s outfitted with relaxing chairs and couches, a piano, and it could be an ideal place for meetings. It is a classic example of the famous early 20th-century industrial Chicago School architectural style. 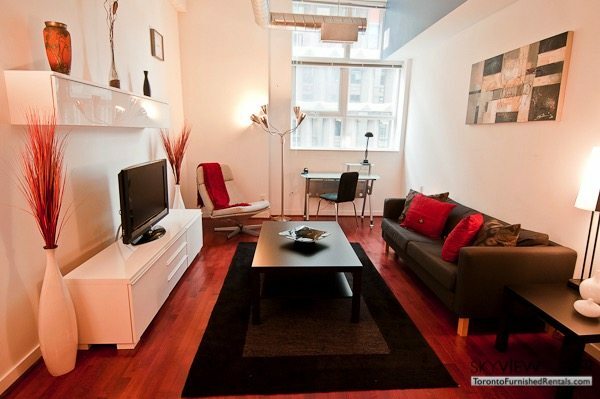 It was historic warehouse situated in downtown Toronto on Dalhousie Street, which was converted into a loft. It is located near the campus of Ryerson University and the Toronto Eaton Centre. It had been built in various phases from 1910-1949. It was used for the Simpson’s department store, later it became owned by Sears Canada after Simpson’s end. The Merchandise Building one of the largest structures in downtown Toronto.